RUPGCET 2019 online application form/how to apply/step by step online applying procedure/ Steps to be followed in filling ONLINE RUPGCET 2019 application form/Instructions to Fill Online Application of RUPGCET 2019. 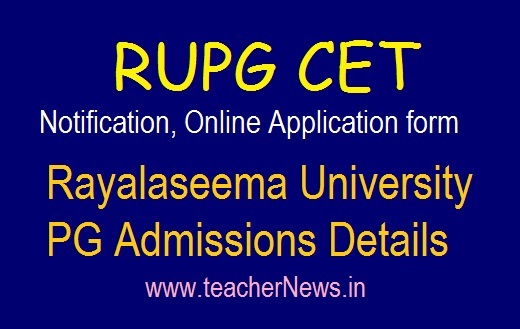 Kurnool Rayalaseema University has released Post Graduate Common Entrance Test (PGCET) 2019 Notification in April, 2019. Who are interested and Eligible Candidates Apply Online Application form at official website www.rudoa.in. RUPGCET 2019 M.Sc., MA., M.S.W., M.Com., M.H.R.M., M.Ed., M.P.Ed., PGDAS., P.O. Diploma in Yoga., 5 Years Integrated Courses in M.B.A. and Nanotechnology for the Academic Year 2019-2019 offered by Rayalaseema University Campus. RUPGCET Application Form, Eligibility Criteria, and Hall tickets & Important Dates here. Last Date for submission of online applications : 04-05-2019. The candidates who have appeared for the final year 2019-20 qualifying examination ( Degree Final year ) are also eligible to take the tests. RUPGCET 2019 Notification, Online Application form, Eligibility, Important dates Download. Rayalaseema University PG M.Sc., MA., M.Com. Admissions link @ www.rudoa.in.